When I was a little girl, I dreamed of being able to speak a foreign language. My wish came true at the age of sixteen when an exchange program to Italy expanded my linguistic horizons and my waistline. Many years later my waistline expanded again, for another reason – and my baby boy was born. I’d always known I wasn’t typical mom material. I’m not good at baking, crafts or keeping my cool. So I reckoned the least I could do was give my son the gift of language. This was something of a linguistic experiment: raising a New Zealand-born, half-Irish, half-American boy in a full-immersion Italian home environment. Nonetheless, it has worked. Today my little linguistic experiment is three and a half and casually uses Italian terms like trasformarsi (change into), spaventoso (frightening) and libellula (dragonfly). He can form complex conjugations of Italian verbs (mi piacerebbe) and correctly modify his adjectives by gender and number to match his nouns (macchine rosse). Not only that, but he also speaks English like a wop. “Look at la dog!” Let’s face it, it’s not easy to choose from the sprawling Italian buffet of articles il, la, lo, i, le, gli (all meaning “the”). So my three-year-old opts for the simple la for just about everything. Even in English. “Me drinkato it.” He likes to show he is a big boy and can use big English verbs like “drink”. The problem is that he doesn’t yet know all those irregular past tenses in English that are so hard to master. So instead, he has been known to attach one of the Italian past (actually, present perfect) tense endings, -ato. “You want to jumpare with me?” In a similar move, he sometimes forms the infinitive with one of the Italian endings (-are, as in mangiare), unaware that the infinitive of “jump” is, well....“jump”. “I sleep why me tired.” The difference between “why” and “because” is basic to any elementary student of English, unless in your native tongue they are exactly the same word, like with the Italian perché. 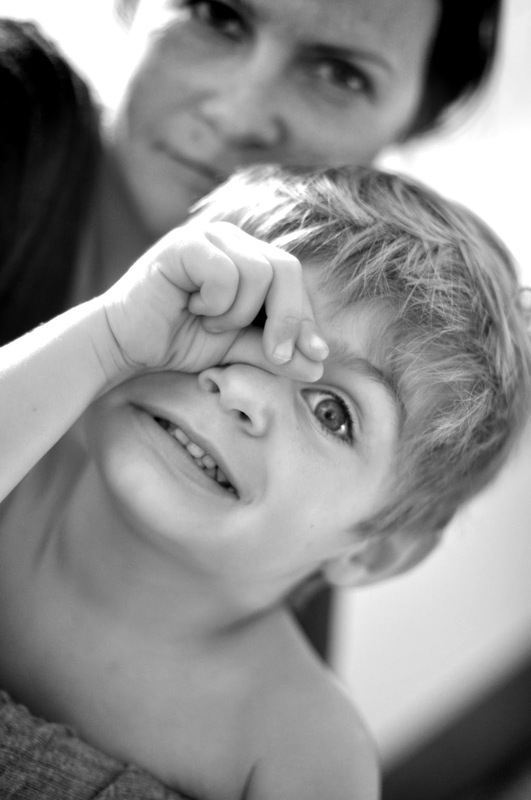 “I make you see.” This is my little man’s version of “I’ll show you”, translated directly from the Italian Ti faccio vedere. “Is stuck me foot.” Word order, shmord order, that’s what I say too. Sometimes the old subject-verb-object word order of English can be somewhat confining and you just want to kick it off, you know? “Look, littles chickpeas!” Yes, I too was impressed with how quickly my son learned to say the big English word “chickpeas” after hearing ceci for most of his life. I was also impressed that he remembered to put the adjective before the noun, because he doesn’t usually. And I was especially impressed that he considered an unmodified English adjective to be a tad too simplistic: if you don’t add an “-s” ending to “little” – as in piccoli ceci in Italian – how are you ever going to know that it refers to the “chickpeas”? Huh, huh? “I no know.” English grammar is often overly complicated. Why use all those unnecessary auxiliaries – like “don’t” or “didn’t” – when you can just say no? I laugh, but the truth is I love my son’s quirky English. But don’t ask my little Irish-American Kiwi without a drop of Italian blood what languages he speaks, because the answer will most likely be “Spanish”. Come va a nanna un dinosauro quando viene il papà a salutarlo? How does a dinosaur say good night when Papa comes in to turn off the light? Sbatte la coda e fa il musetto? 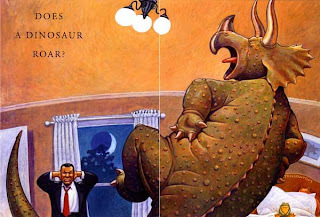 Does a dinosaur slam his tail and pout? Getta per aria il suo orsetto? Does he throw his teddy bear all about? Grida, urla e batte i piedini quando vuole un’altro dei libricini? Come va a nanna un dinosauro quando viene la mamma a salutarlo? 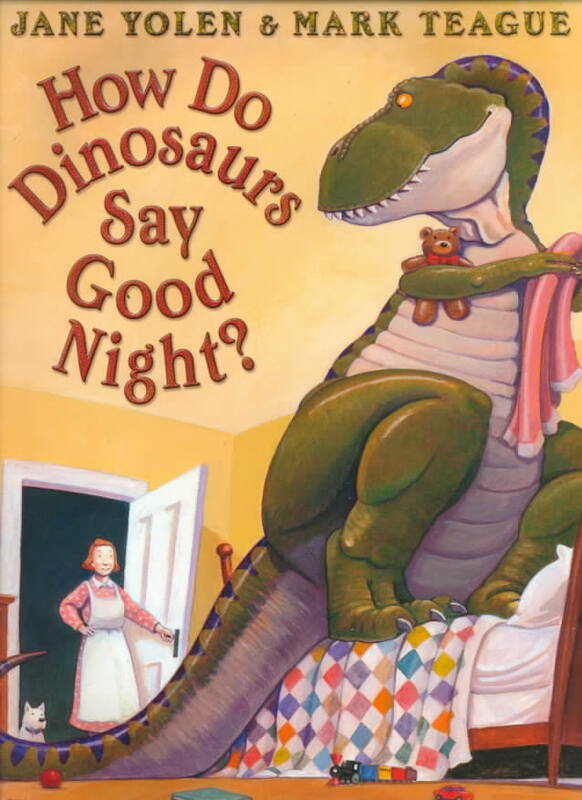 How does a dinosaur say good night when Mama comes in to turn off the light? Comincia la testa ad oscillare? Does he swing his neck from side to side? A cavalluccio vuole per forza andare? Does he demand a piggyback ride? Si lagna, sospira e si sconsola? Does he mope, does he moan, does he sulk, does he sigh? Piange disperato sopra le lenzuola? Does he fall on the top of his covers and cry? Ma no…I dinosauri neppure ci pensano. Dànno un bacio. No, dinosaurs don’t. They don’t even try. They give a big kiss. They turn out the light. Sotto le coperte si rannicchiano, e dopo la “Buona notte”, zittiscono. Dànno un abbraccio fortissimo e un’altro bacio dolcissimo. They give a big hug, then give one kiss more. Buona notte. Buona notte, piccolo dinosauro. Good night. Good night, little dinosaur.